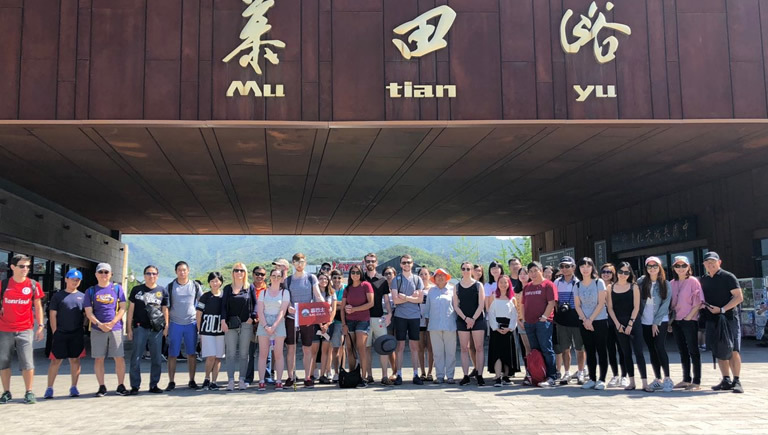 Activities: Board Mubus with your expert tour guide to take you to visit the Mutianyu section of the Great Wall, giving you around 5 hours to explore independently before heading back to Beijing downtown. English-Mandarin speaking guide on bus. Internal shuttle for uphill and downhill. 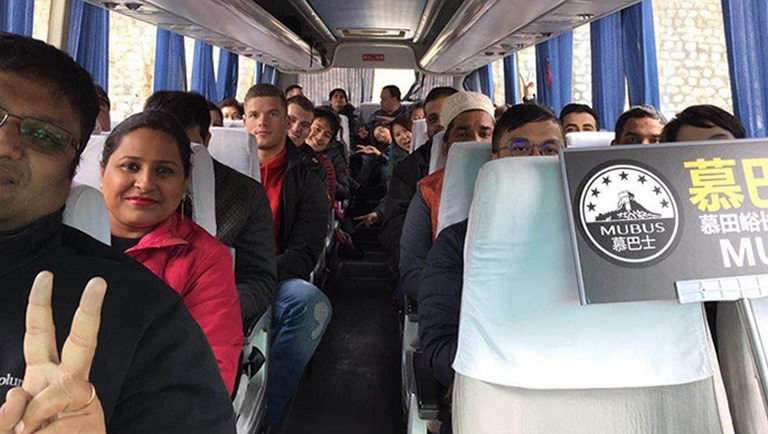 40 minutes guided tour on the Great Wall by expert. Arrive at the meeting point between 07:30-07:40. Catch the subway early in the morning to get to Dongsishitiao （东四十条） metro station on Line 2 on time. After coming out of Exit C, walk east along the side of the road for 50m. 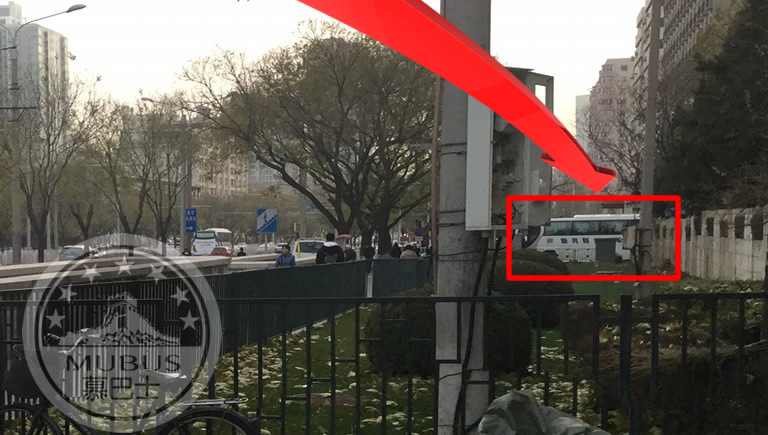 The Mubus departure point is located 50m east of the Beijing Swissotel Hotel. 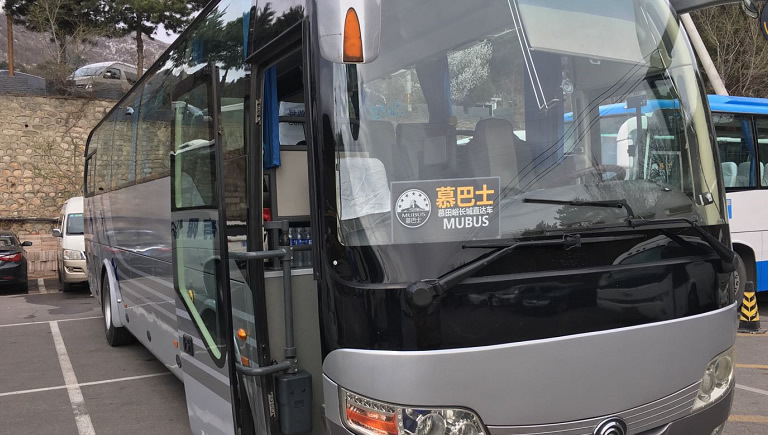 To the side is your departure point, where you will see our Mubus personnel and coach on the road awaiting your arrival! Please find our Mubus personnel who will be wearing a red uniform and holding a Mubus sign. Present your reservation confirmation to them, then you can board our coach. After having boarded the coach, please take a seat. We ask passengers to please keep the same seat for the return journey. If you are bringing luggage, you can place it in the luggage hold. 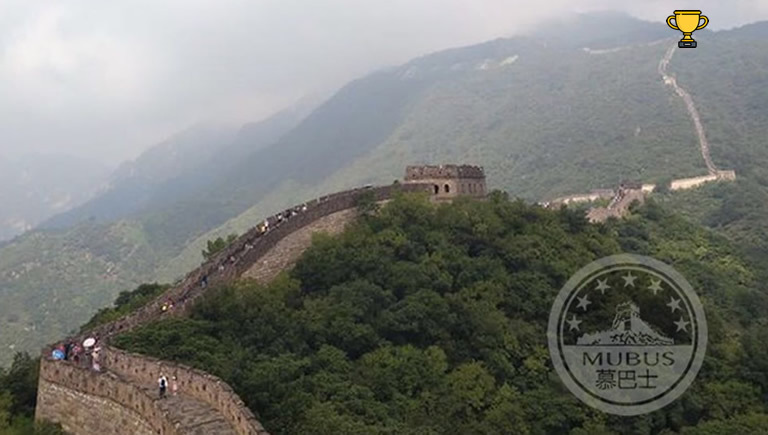 ‘You are not a hero until you have climbed the Great Wall.’ Therefore, today it is Mubus’ pleasure to accompany all of you on your journey to become a ‘hero’ and ascend the Great Wall of China. The first bus will leave at 07:30 (07:00 during the holidays) and leave every 10-minutes afterwards, with the last bus departing at 08:00. We highly recommend that you take the first bus. 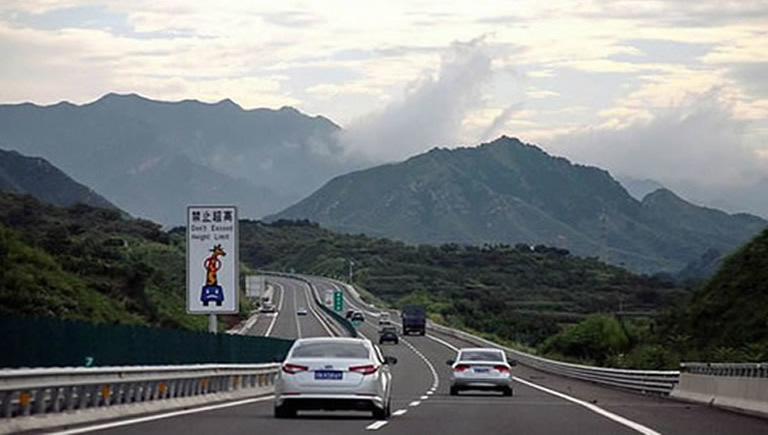 Once the coach has set off, get onto the highway to Mutianyu which is about 90km away from our starting point. 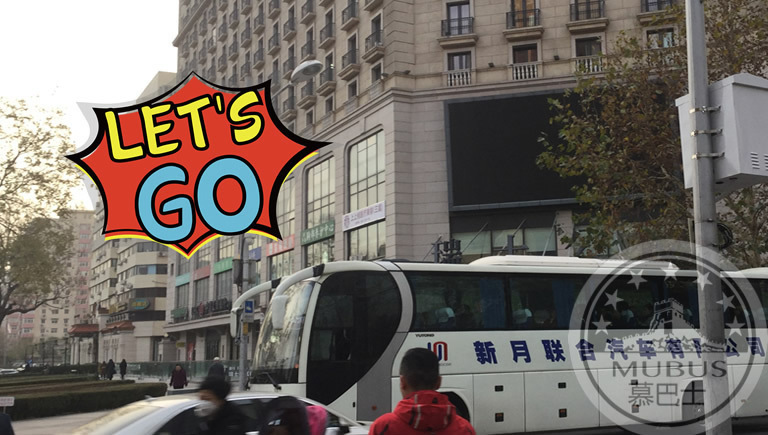 The journey lasts about 1.5hrs so sit back and enjoy the scenery of Beijing’s suburbs along the way! 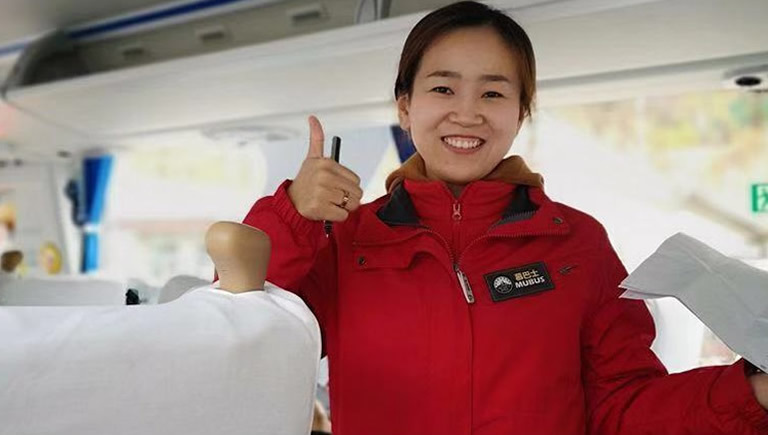 Each coach will have a tour guide, explaining to you in both Mandarin and English how to make the most of your time exploring the Great Wall and helping you to quickly buy tickets. Arrive at the gate’s entrance at approximately 09:30 where we will give you time to use the toilets and take a few pictures from the bottom. Your tour guide will go to the ticket office and buy the tickets. 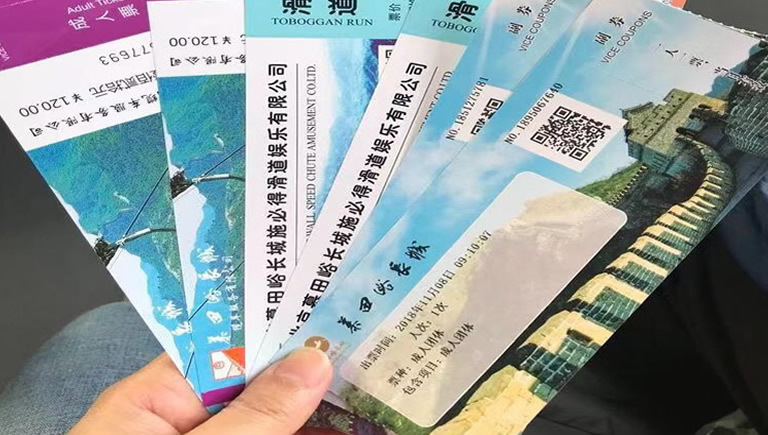 Several minutes later, your official Great Wall tickets will be handed to you, whether you opt for the cable car or chairlift and toboggan option. Now you’re ready to ascend Mutianyu! 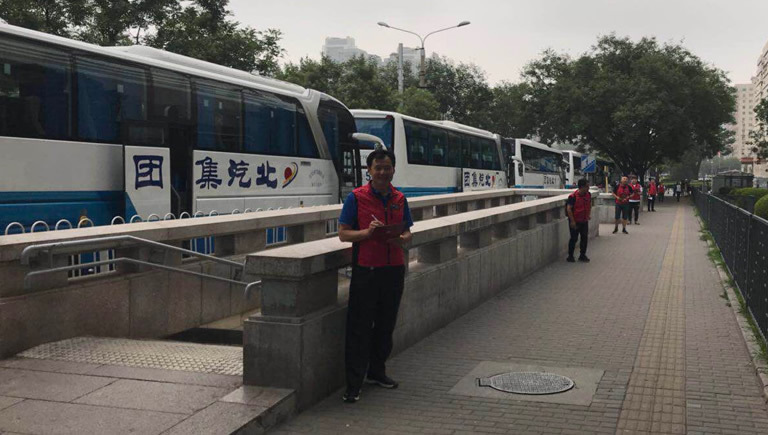 Your tour guide brings you on a 5-minute walk through the small scenic spot to arrive at the shuttle bus station. However, you don’t need to board the shuttle bus – our Mubus will take you uphill from right here. 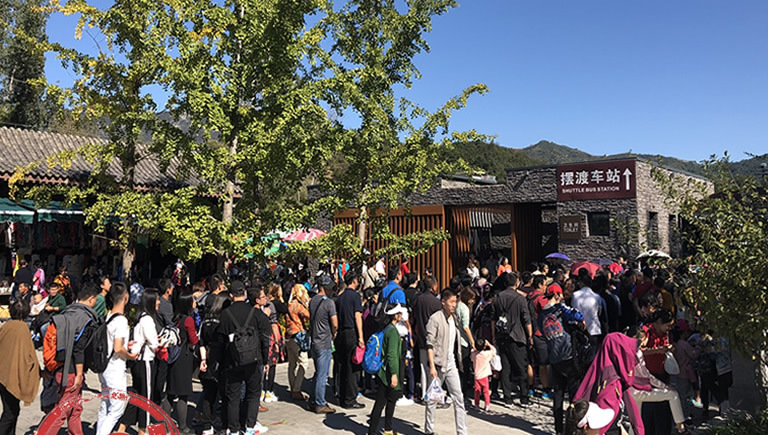 While other tourists are still waiting in the busy queue for the shuttle bus, you will have already ascended the Great Wall -saving you 15 RMB as well as precious time on the Great Wall! 3km away from here, the Mubus coach will wait in its VIP parking space at the bottom of the mountain. 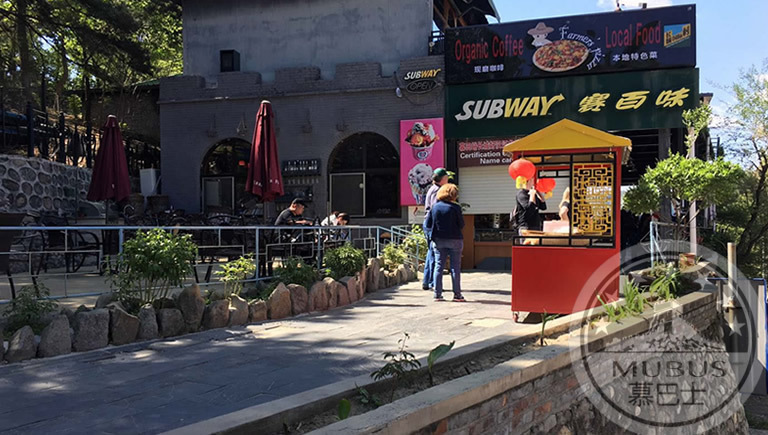 To get here, you need to walk 300m from the Great Wall ticket inspection office. 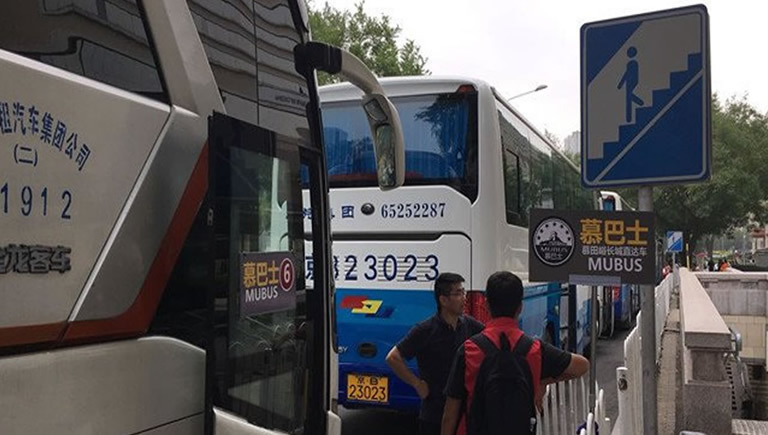 You must come back to this coach when the tour is over. In order to make sure that you reach Tower 20 to become a great ‘hero,’ we advise you to take the cable car. By taking the smooth high-speed Japanese cable car, you will arrive at Tower 14. 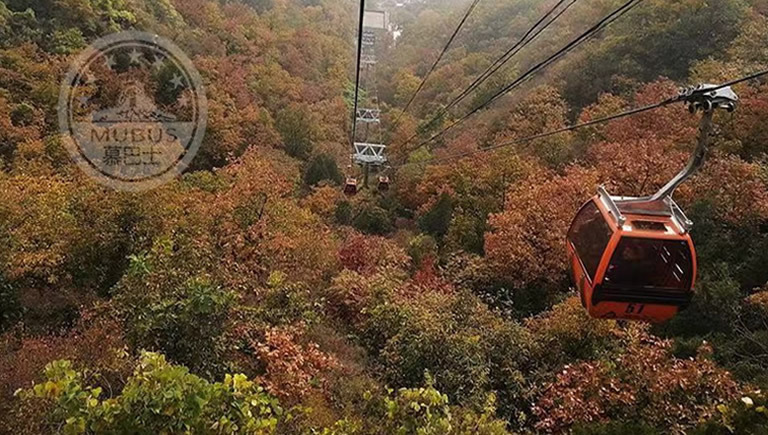 When ascending the cable car to the top, appreciate the beautiful scenery from a bird’s-eye view! See how the Great Wall snakes dramatically through the green pines and cypresses. Upon arriving at Tower 14, we advise you to walk west from Tower 14 towards Tower 20. 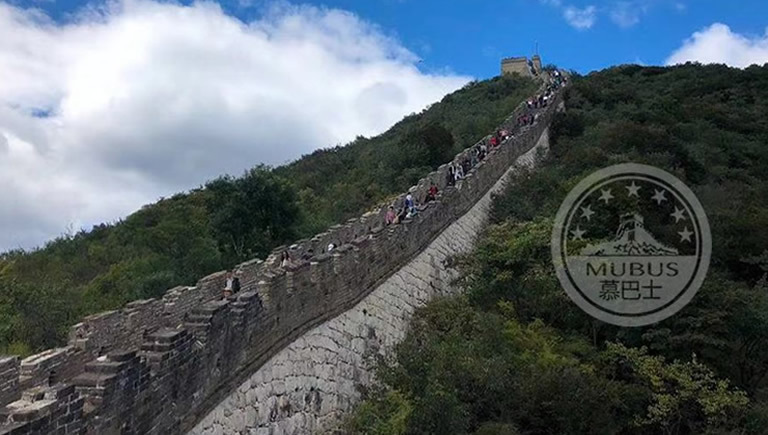 Stroll along whilst admiring the beautiful scenery of the Great Wall. 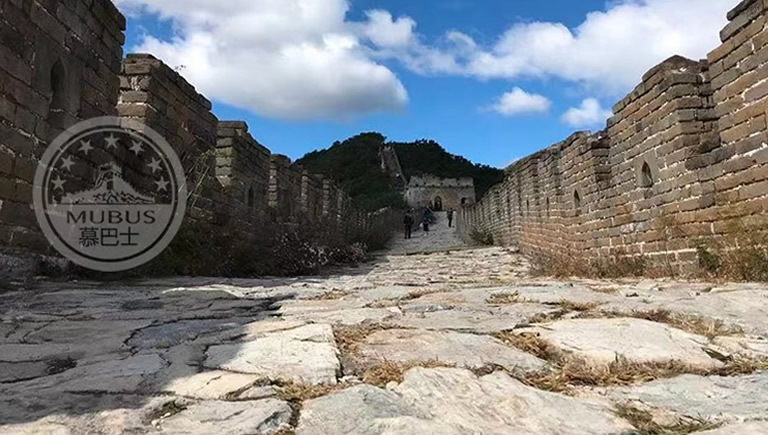 This part of the Great Wall has a gentle gradient, so you can slowly stroll along taking photos as you please of the cloud and mist encircling the mountain peaks while approaching Tower 20. Tower 20 is Mutianyu’s highest viewing point of the Great Wall, but if you still have enough energy you can continue to climb further. Carry on exploring the world of the ancient Great Wall’s ruins. 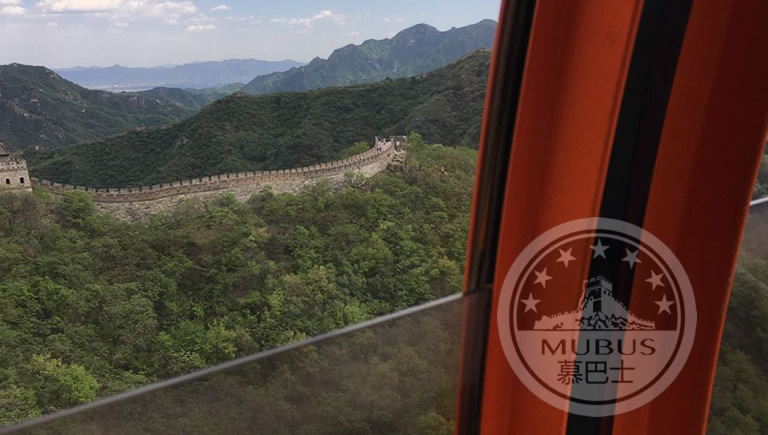 From here you can witness the Great Wall’s changes and discover more majestic views– this a part that is deeply intertwined with a rich history! 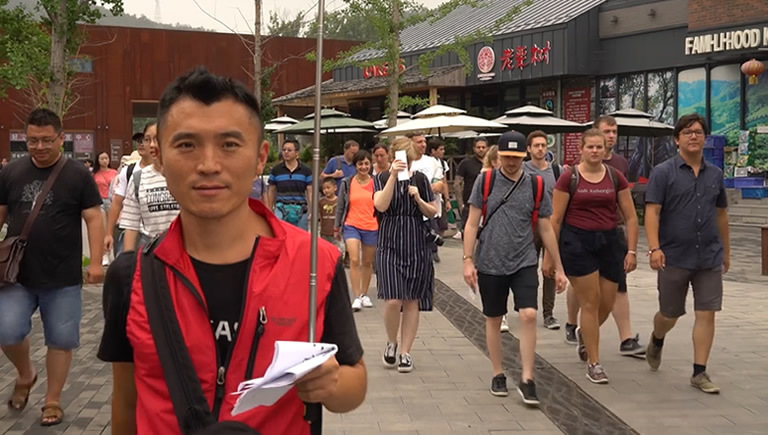 You will spend about 3.5 hours hiking on the Great Wall before taking the cable car down the mountain to have lunch at a restaurant of your choice. There are 3 restaurants available nearby the parking lot. 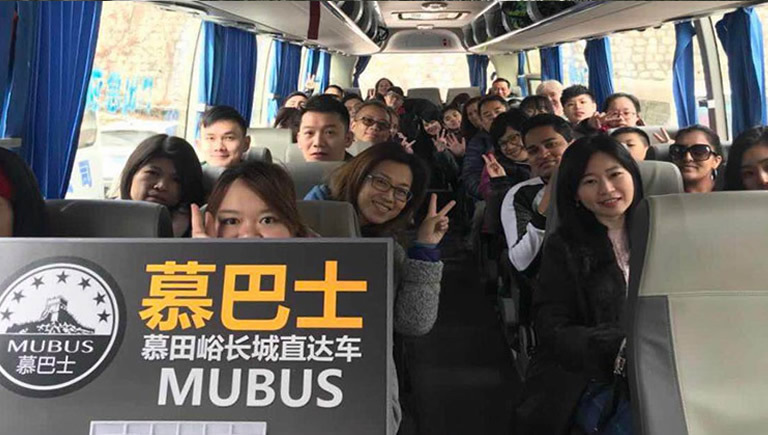 At 14:30, the Mubus leaves the Mutianyu Great Wall and returns to Beijing downtown. 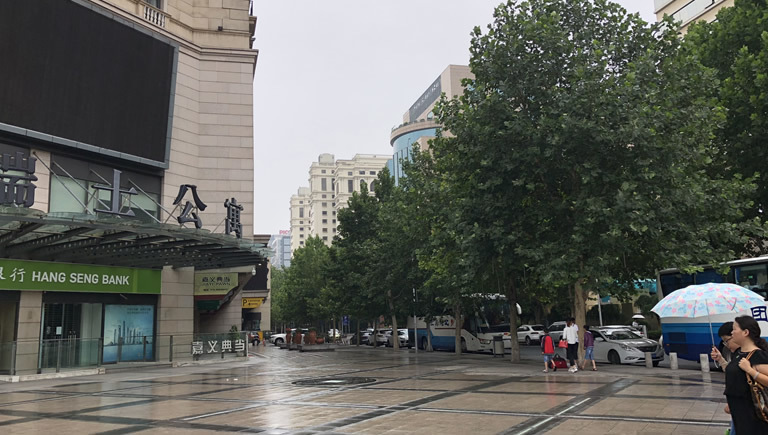 Between 16:00 and 16:30, Mubus will reach the Beijing Swissotel Hotel and you can take the subway to go to your next destination.